I touched on this yesterday but it's worth mentioning again. Recently, Colorado Democrat Jessie Uliberri argued people should defend themselves against a madman shooter with…. ballpoint pens. Two things wrong with this. The first being that Uliberri argues people should waiting until a crazy person reloads before taking action, or in other words, wait until they are done shooting people. The use of a firearm for defense in this case wouldn't require a waiting period but rather would stop a madman from continuing his rampage. The second, ballpoint pens? Really? I was always told not to take a ballpoint pen to a gunfight. 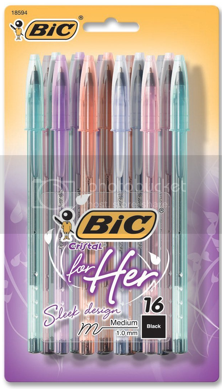 The good news is, I found some ballpoint pens for the ladies to use against their attackers.